This project resulted in the new building digital capability service. We're working to ensure staff in universities and colleges are equipped for a changing digital environment. This project is now a full service. Visit the building digital capability website to get started. Building on our previous work on developing digital literacies for staff and students and through a consultation with a range of stakeholders using our co-design approach, we identified the current challenges institutions face when developing the digital capabilities of their staff and students. Our digital capability framework (pdf) describes the skills needed by staff from a wide range of academic, administrative and professional roles to thrive in a digital environment. Our ‘digital discovery’ tool (beta) has been designed to support individual staff (and soon students) working in universities, colleges and training providers to reflect on their digital capabilities. 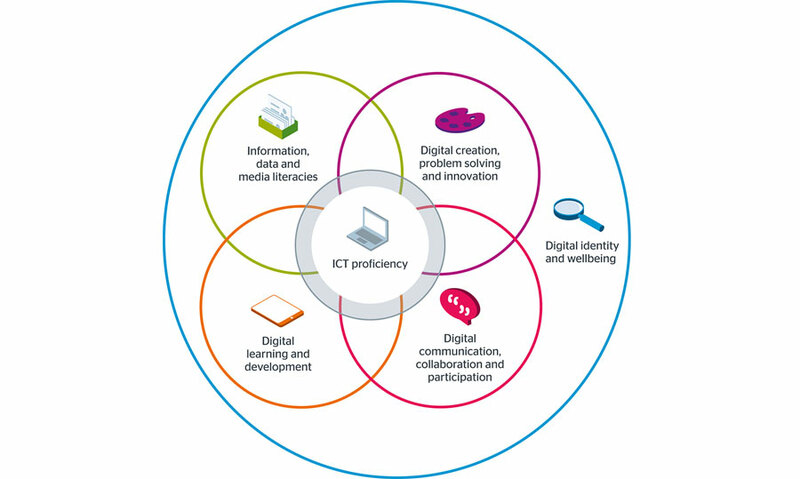 The tool presents a series of reflective questions that relate to the different elements of digital capability as defined in our digital capability framework (pdf). These are followed by a visual profile of their capabilities, feedback and suggested actions and resources that might help staff and students progress. Our first beta version of the tool was piloted with 14 institutions from February 2017 – June 2017. You can read more about the journeys of six of the institutions involved, and what we learned from this pilot on our project blog. Following feedback gained from this pilot, the tool has been redesigned and developed in a new platform. The new beta tool is being piloted by 100 organisations across FE, HE and skills from January to May 2018. The evaluation of the pilot will be used to inform the future of the service. To find out more and keep in touch with the work visit our project blog. The next opportunity to get involved with the tool (outside of the pilot) will be September 2018. Please contact the team (digitalcapability@jisc.ac.uk) if you’d like to find out more. We’ve designed a series of role profiles, which align to the framework and highlight the digital capabilities associated with particular roles. The profiles have been developed collaboratively and mapped to relevant professional frameworks. They are designed to support team leaders in identifying the digital capabilities their teams need. In collaboration with the Higher Education Academy (HEA), we have also deveoped a digital lens on the UK Professional Standards Framework (UKPSF). Our guide to developing organisational approaches to digital capability has been created to support organisations with developing their culture, infrastructure and practices to grow organisational digital capability and enable individual digital capabilities to flourish. Our briefing, developing organisational approaches to digital capability (pdf) is designed to help you, as an organisational lead, consider how our resources can help build digital capability in your organisation. It includes a model describing the digitally-capable organisation (pdf) as well as a step-by-step guide (pdf) with practical actions and activities for you to consider when building digital capability in your organisation (pdf). Our editable audit tool (Word doc) and checklist (Word doc) give you a place to start on your journey, offering prompts for identifying priorities for development. We've also developed a checklist for curriculum developers (Word doc) to help course teams assess how well a course of study is preparing learners with the right kinds of digital capabilities. Download our briefing paper: delivering digital change: strategy, practice and process (pdf). Our report deepening digital know-how: building digital talent (pdf) identifies key issues and future requirements for the digital capabilities of staff in UK HE and FE. To share your experiences, hear from others and continue discussions around staff and student digital capabilities, join our community of practice via the digital capabilities JiscMail list. As of September 2018, this project will transition to a full service. If you are interested in the service please see our building digital capability website. If you would like to receive a quote for your organisation please fill out this form. If you would like to be kept up to date with progress please subscribe to our community of practice mailing list. Building digital capability project starts.